Yay! We are very excited to let you know that we have created a pdf quilt pattern for our most beloved quilt – Lottie’s Squares. This pattern is by far our most requested quilt and tutorial, so we decided it was time to make our pattern official and available. Lottie’s Squares is named after my great-grandmother, Lottie, who used this block in so many of her quilts. In the past couple of years, we too have created a version of this pattern in Blue and White and also in a Woodland Creatures Window Panes. So What Do You Get with Our Lottie’s Squares Quilt Pattern? 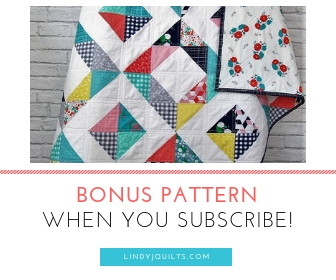 With our quilt pattern, you will receive professional instructions including Fabric Requirements, Cutting Instructions, Block Assembly, Quilt Assembly, and Diagrams. Lottie’s Squares is a versatile and beginner-quilter-friendly pattern. Lottie’s Squares showcases your fabric collection by using 4” squares that are partially framed with 1” borders to create 5” finished squares. Our Lottie’s Squares quilt pattern allows for adjustment to your quilt dimensions. Our pattern has yardage requirements for a placemat/mini quilt, baby quilt, toddler/crib quilt, lap quilt, twin quilt, and queen-sized quilt. Lottie’s Squares – Four Layout Options! And as a bonus – there are FOUR amazing quilt top layouts to choose from! So with ONE quilt pattern, you are actually getting FOUR! We created another beautiful Lottie’s Squares Quilt in Red, White, and Blue designer fabrics. We used quite a few fabrics from Riley Blake’s Star-Spangled Doodle Bug Collection and we incorporated many of our own red, white, and blue fabrics we had in our fabric collection. You will see Fireworks, Hearts, Bunnies, Frogs, Flowers, Swans, and Various Geometric Shapes throughout this quilt. We used a lot of different fabrics so this quilt is full of I-spy patchwork. We used 1” Kona White strips and the white framed pieces allow for the fabric patterns and colors to pop and shine. We used the Star Spangled Hearts in White for the quilt back and our favorite Dress Stripes in Red for the binding. Our sweet Red, White, and Blue quilt measures approximately 40” x 50 – a perfect size for a baby gift, toddler gift, or even a grown-up gift! Our Red, White, and Blue Lottie’s Squares quilt available in our shop. We absolutely love working with the Lottie’s Squares quilt pattern, and now you can too! We also offer pre-cut 1 ½” fabric strip bundles. Our bundles will save you loads of cutting time so that you can get straight to sewing! We are thrilled to have my great-grandmother’s favorite quilt pattern now available! I personally have many fond memories of her quilts that were handed down to my grandmother and my mother. Now back to more sewing for us – see you soon!